"One word of warning: Make twice as much as you think you are going to need. This stuff is seriously addictive." Drain tomatoes in a strainer for 15 minutes. 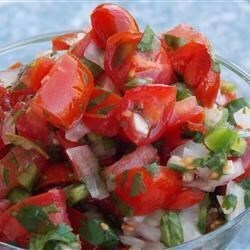 Combine tomatoes, onion, jalapeno pepper, serrano pepper, and garlic in a large bowl. Pour lime juice over the top. Stir in oregano, cayenne pepper, salt, sugar, mint, and cilantro. Refrigerate for 1 hour. Season with salt to taste. Yummy! Very fresh and delicious! It wasn unlike any salsa I've had. I like the fresh, crisp flavors; too much lime juice. A great garden fresh flavor that is perfect anytime.